Posting for a friend with an M100. Under acceleration, the car shutters and shakes. Stops on Deceleration. Only get it when you push on the gas pedal. 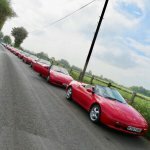 http://www.lotusowners.com LOONYs (Lotus Owners of New York) 91 Elan, 71 Elan, Elan GTS, 66 Elan Coupe, 99 Elise190, 05 Elise, 93 Caterham, 74 Europa, President of Lotus Ltd, USA's largest Lotus Club. Sounds like the engine... Or the drive train. Tony, a man of your experience posting so little information and hoping for a sensible answer... Really! Try coil packs, they work in pairs so if it is failing under load it can take out 2 cylinders. Ease off and it goes back to 4. Otherwise injectors for the same reason but luckily the pairing is different. .... so whilst Simons answer is far more likely to be correct than mine, I would offer things like engine mount(s), suspension bolts, (or any loose bolts! ), driveshaft(s) or even something simple like a losse wheel/buckled alloy. My first thoughts were mechanical too. But there isn't much info to go on. If it is hit and miss under hard acceleration it could be the coil packs ???? Check the timing that wont cost you anything before you start changing parts and its always worth checking anyway. Last edited by alan e on Sun 09.09.2018, 18:08, edited 1 time in total. Bad drive shaft CV Joints or bad bearings in the Center Shaft? They will only go out of balance when being torqued, so not overly noticeable when testing in static mode or when jacked up. My first thought was also something mechanical. I had a vibration under acceleration between 50 and 70 mph. As soon as I lifted and settled to a steady speed, the shudder reduced/stopped. Didn't happen on lift off or deceleration. Checked front bearings, wheel balance and suspension locations but all OK. Eventually looked at driveshafts and the WSM: symptoms indicated inboard joints of driveshafts (as per WSM). So fitted new driveshafts and problem solved. HOWEVER If this is your problem SJ Sports no longer have any in stock. There may be some elsewhere, but you may have to get yours rebuilt. As stated above do basic checks of the electrics first, but my suspicions are with the driveshafts. What do you mean by WSM? It’s not aTLA I know. Brit-Car-Nut wrote: Work Shop Manual? I thought most people on here used this acronym. CDM awarded to BCN for correct answer. If you can still buy it in USA. Since we are flinging things out there - and based on the lack of info - possibly clutch. Some more symptoms would help. I am assuming CDM is Car and Driver Magazine (yep, it is still available over here), but I prefer Cult of the Dead Moron. Two countries separated by a common language! My first thought was was mechanical too, but I read through the non existent lines and deduced that Tony would have worked through the "usual" things and was looking for an M100 specific answer. Thanks for the ideas guys. I am only relaying what my friend told me. I have not seen the car yet. I am hoping for the coil packs. Not hoping for the CVs. Will let you all know. John_W wrote: What do you mean by WSM? Weston-Super-Mud : A local seaside holiday town.